One of Booths most popular patterns, dating from c. 1924. Production continued until at least 1939, possibly later. 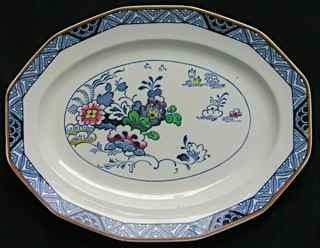 Many Netherlands items were produced in the elegant, oriental-inspired OCTAGONAL shape also found in Booths' similar Pagoda pattern. 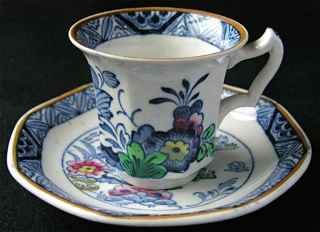 The distinguishing feature of this shape is the combination of an octagonal cross section with a circular rim, found on cups, jugs, teapots, etc (see photo right). Around the same time, the firm of WOOD & SONS produced items in an almost identical shape - see the Alva, Old Bow Kakiyemon, Rangoon and Westover patterns. 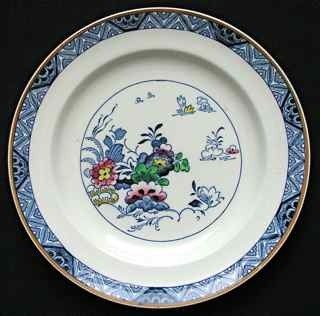 Netherlands plates were also produced in circular and twelve-sided shapes. Netherlands is occasionally found in a plain blue & white version (A1967), without any of the hand-painted colours, and this variation is sometimes given the pattern name The Everest. All the examples shown below are coloured.